While the State of Texas operates within a spending limit contained in the Texas Constitution, the United States Constitution contains no such limitation. It is the omission of such a spending limit from the Constitution that has allowed the federal government to engage in deficit spending, resulting in the record levels of debt that the taxpayers of the United States must now (or eventually) repay. As a result of this unprecedented and reckless federal spending, President Obama signed the second national debt extension of his presidency on February 12, 2010, increasing the ceiling on the debt from $12.4 trillion to $14.3 trillion. As of August 17, 2010, the United States national debt figure stands at $13.3 trillion. As the figures show (see below), national debt exceeds year-to-date gross domestic product and year-to-date federal tax revenue combined. Year-to-date federal spending also outstrips federal tax revenues by a factor of 2.5. Congressional spending is rapidly becoming unsustainable, making swift and decisive action necessary to limit the ability of the federal government to spend without regard to revenues, debt, or future implications when our creditors call our debts due. Sources: U.S. Department of the Treasury, U.S. Census Bureau, U.S. Federal Reserve System, & the Congressional Budget Office. Where necessary, figures rounded to nearest $1,000,000. While federal deficit spending has been a problem for decades, the response to the recent economic recession together with the other fiscally disastrous policies of the Obama Administration has greatly exacerbated the problem. After the Bush Administration initiated government bailouts of private businesses in late 2008, the Obama Administration has continued full-steam with the same, failed notion that government spending would save the economy. In the same vein, the trillion dollar health care reform enacted by Congress and President Obama is the culmination of almost a century of expansion of the welfare state and the federal spending that goes with it. stability. Increasing taxes to cover reckless federal spending will only damage the economy further while barely delaying the inevitable crisis that will always follow fiscal profligacy. A Balanced Budget Amendment An amendment to the United States Constitution that requires annual federal appropriations to not exceed annual federal revenues (with an exception for times of national emergency) would require the federal government to live within its means rather than engaging in deficit spending and debt issuance that perils the entire nation. A “national emergency” exception that covered crises such as wars should be included in any balanced budget amendment; few would argue that the deficit spending during World War II was undesirable and a balanced budget amendment is intended to protect rather than endanger the nation. 2007, however, the gap between spending and revenue has exploded, resulting in a projected $1.5 trillion federal budget deficit in 2010. A balanced budget amendment would tie these two numbers (spending and revenue) together, preventing deficit spending and related debt. Historically, attempts to enact such an amendment at the federal level have proven unsuccessful. However, the United States Constitution gives the states the power to address national problems when our federal government refuses to yield. Under Article V, an amendment to the Constitution must be considered if two-thirds of state legislatures call for a convention. Once a convention is called, the amendment is adopted if three fourths of the state legislatures or state conventions ratify it. While Texas’ petition for a balanced budget amendment – together with petitions from numerous other states – technically remains current, the petition should be reissued by the 82nd Legislature so that the call for a constitutional convention on the narrow topic of a balanced budget amendment is reinvigorated. Requesting a convention on the single topic of a balanced budget amendment would help ensure that any convention remains focused on the issue at hand and does not undertake broader revisions to our nation’s founding document. Indeed, speculative concerns that a convention could result in a broader re-write of the Constitution must be balanced against the possible bankruptcy of our nation if a constitutional prohibition against deficit spending is not enacted. Furthermore, three-fourths of states must approve amendments to the Constitution under the convention process which would provide adequate protection against unfavorable changes to the Constitution. Federal spending is growing at an unsustainable level, adding to the national debt that future generations will be forced to repay: A balanced budget amendment is necessary to permanently arrest the problem of deficit spending. 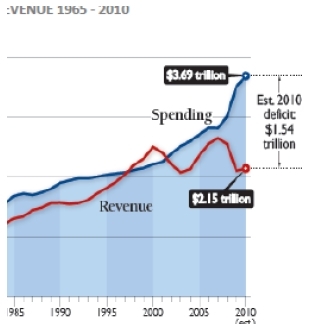 – Federal spending has outstripped federal revenues almost every year since 1965. – This trend has exacerbated since 2007, leading to a projected federal deficit of $1.5 trillion in FY2010. – The federal government cannot sustain this deficit spending in perpetuity, the burden on taxpayers will become too great, and the credit of the United States will be stretched to breaking point. A balanced budget amendment is imperative to ensure that the federal government lives within its means and stops adding to the deficit. – A federal balanced budget amendment would tie federal spending to federal revenue each year. – This would prevent the deficit spending and debt that all taxpayers will eventually have to repay. – Relying on each individual Congress to balance the budget has proven to be a failed approach. A constitutional balanced budget requirement is necessary because it will prevent all future Congresses from spending that the nation cannot afford. – The State of Texas has both a constitutional spending limitation that prevents deficit spending and one of the strongest fiscal records of any state in the nation. – Texas’ spending limitation prohibits deficit spending and restrains budget growth to a measure of the economic growth of the state. – The constitutional balanced budget requirement under which the State of Texas operates yields significant fiscal benefits to the state. – Despite two budget shortfalls (when revenues have fallen below the estimated cost of growing government programs and services to keep pace with population and cost growth), the State of Texas has netted a $26.9 billion surplus since 1994. – If the federal government was to operate under similar fiscal constraints, taxpayers would not be facing the multi-trillion dollar budget deficit that they face today. – Texas can be a leading advocate for a balanced budget amendment to the U.S. Constitution and must pass a resolution in the 82nd Legislature in order to get the process underway. i “Is Greece Europe’s Fannie and Freddie?” Randall Forsyth, Barron’s Online, February 11, 2010.
ii United States: Selected Issues Paper, International Monetary Fund, July 2010.
iii “U.S. is Bankrupt and We Don’t Even Know It,” Laurence Kotlikoff, Bloomberg Online, August 10, 2010.
iv The Congressional Budget Office, “The Long-Term Budget Outlook,” June 2010.
v The Congressional Budget Office, “The Long-Term Budget Outlook,” June 2010.
vi James Kenneth Rogers, The Other Way to Amend the Constitution: The Article V Constitutional Convention Amendment Process, Harvard Journal of Law and Public Policy, 1005, 1008 (2007). vii Text of House Concurrent Resolution 31 (65R) as introduced. For more on this, and other important issues go to http://txcc.org/. I would be very much for a balanced-budget amendment that stipulated debt could only be incurred as a consequence of a *declared* act of war. The spending chart shows 30 years of Republican rule interrupted by a Clinton surplus. Pretty cheesy.